I have been a massage practitioner and bodyworker since 1995. 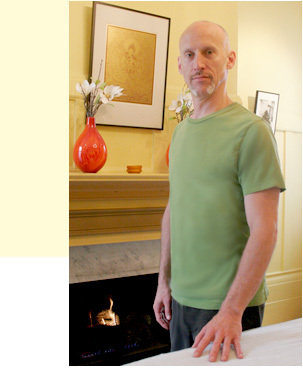 I'm a graduate of the San Francisco School of Massage, establishing my Body Luminous practice in San Francisco in 2005 (SF Massage Practitioner #02071). Bodywork is both a passion and a teacher to me, as I am continually learning from my practice, of the internal intricacies of the human body and energy field. My Body Luminous therapies combine elements from complementary massage modalities, infused with techniques formed from my studies and experiences in Chinese Kung Fu, Tantric disciplines, and the body arts of massage and holistic healing. I am a tenth generation disciple of Seven Star Praying Mantis Kung Fu and practitioner of Sap Bat Lo Han Gung (Chi Gung). I continue my journey through ongoing trades of information and technique with fellow bodywork professionals, as well as further coursework in body sciences. My therapies address needs that range from subtle recharging and balancing of organ meridians / energetic channels of the body (Acupressure), to deep manual therapy for training and recovery from injury and repetitive stress (Deep Tissue and Sports), to relaxation, recharging and stress abatement (Swedish), to energetic recalibration of the cerebrospinal fluid system (CranioSacral), to subtle draining and release of toxins, wastes and excess fluid from the body (Lymphatic Drainage Therapy). For each Body Luminous session, I tailor the therapy to the individual’s needs and bodywork goals, bringing my personal touch and intuition to create a superlative experience with profound and healing results.